A RARE AND EARLY PEWTER WASH BASIN. Germany, c. 1800. 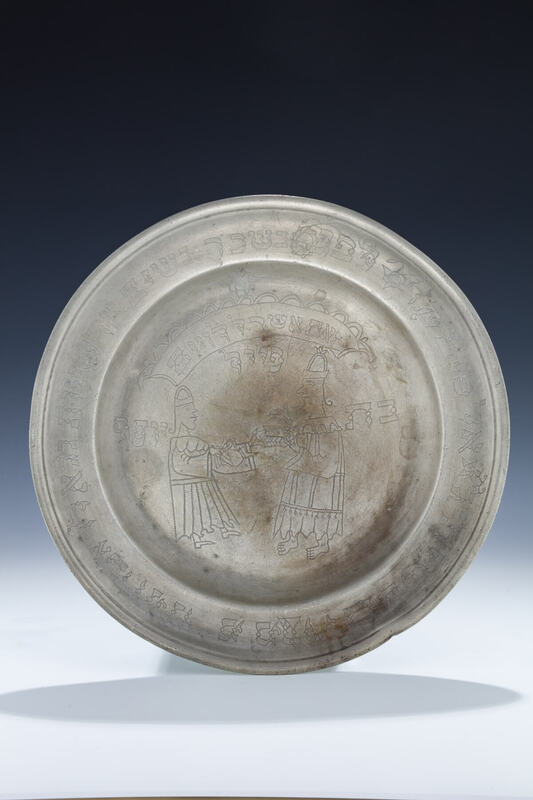 Decorated with engravings of a high priest washing his hands and a Levite holding a laver. Engraved in Hebrew: BELONGS TO THE LEVITES, FEIEL, DAUGHTER OF YOSEF and ON THE MERITS OF THE RIGHTEOUS WOMEN, WERE OUR FOREFATHERS REDEEMED FROM EGYPT. Formerly in the collection of Asea and Jacobo Furman. Published: TREASURES OF JEWISH ART, page 78. 11.7” wide.